I have been totally slacking the last few days with my blog! Today will be the same. I got back into Milwaukee last night, felt good to be in familiar surroundings even though it will only be for a few days. I needed a hair cut in the worst way and my wonderful stylist for the last 10 years came through and met me at her salon early to do it. So, a big shout out to Roselle! She could be a stylist for the stars but she has chosen to remain in Milwaukee to make sure that folks like myself can feel like a star! I went and picked up my daughter after so we could have lunch and she could apply for a few summer jobs, it was good to see her! She also graciously volunteered to wash all the souvenir items I have collected on the first half of this trip. My ex-wife doesn’t know it yet but I put some more stuff I am not using in her storage locker which freed up some space in my car. Since she probably doesn’t read the blog any how, I don’t think she will even realize it! I then spent the remaining hours before game time doing my laundry and cleaning out my car. I will be heading to Madison tomorrow night to see the Mallards play. They asked if I would like to throw out one of the ceremonial first pitches and I agreed. But, I haven’t heard back from them so I don’t know if I will be doing that or not. I have noticed that with a lot of teams, their public relations people get a hold of you rather quickly but they never seem to confirm anything with you. Some of the media is like that, also. I was suppose to do an interview in Lexington with a TV station but I was the one that totally forgot so I shouldn’t complain too much, must be Karma! 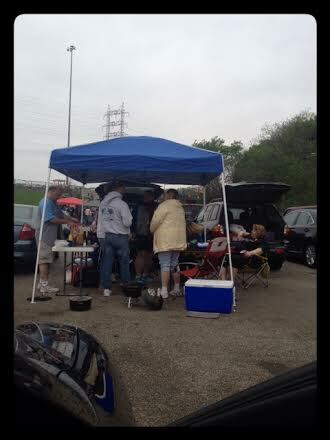 Tailgaters outside my car and in the rain! Go Brewers! Well I need to wrap this up as I am currently sitting in my car in the Brewers parking lot with all my windows blacked out. I hear some people outside my car who are tailgating in the rain wondering if there is a dead body in the car. I just opened the door and scared them. They are having a good laugh right now! I will be hanging out with my daughter after the game and again on Thursday; so, I am sure I might be slacking for a few more days! I have e mailed Dean John and his email is drennicke@kapcoinc.com and that’s Dean Rennicke his name. It would be so great for you both and me if you met and interviewed. Good luck and have fun John! Wow John, you are finally back home in Wisconsin for a few days and enjoy the time with your daughter and family I know you miss them terribly. Anyway if you can try to get an interview with my friend Dean Rennicke of the Lakeshore Chinooks. I would consider it a personal favor, and my contribution to this project if I got the two of you together. He’s a great guy and baseball man. If he has time he will be very resourceful to your needs and comfort at his ballpark. If a friend of mine, met you it would feel like a part of me was there and two new friends would be joined. As I said he went to my high school, seven years older than me. He was a minor league Dodgers pitcher before his arm gave out and he has worked for the Brewers, WTMJ and now Kapco since returning to Milwaukee among other things.let me know how it goes or if I can help you with the contact. Take care, best wishes and enjoy Wisconsin! Paul. If you can let him know I will be at the game on Thursday that will be great! Would love to meet him!